1000 Halo / Free Kibble Meals Shelter Winner, Meow.com Winners, and Tiniest Tiger Tote Winner Annoucements! 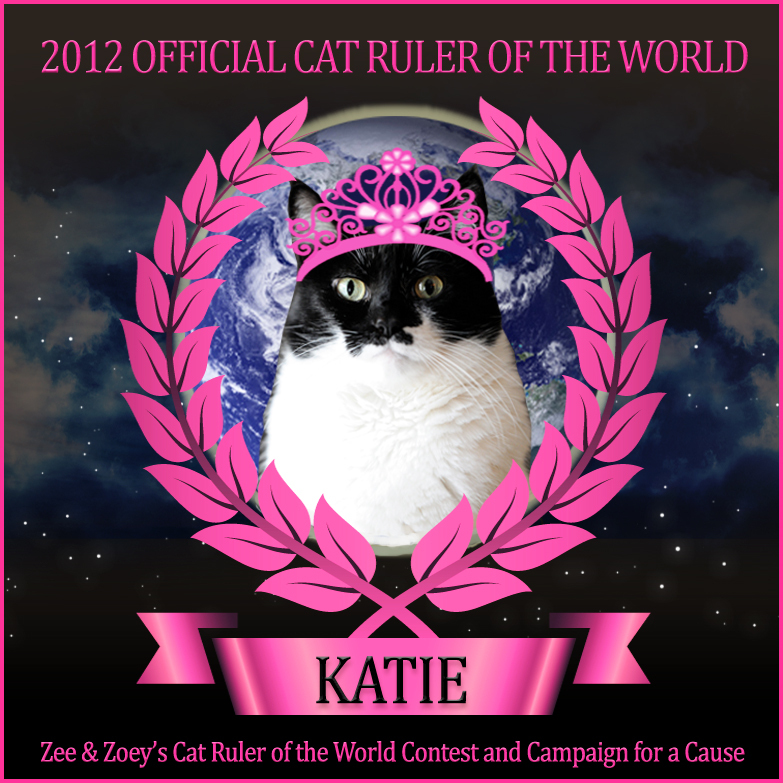 On the heels of crowning Katie of Glogirly as the official Cat Ruler of the World last week, we still have a few more announcements to make and prizes to give away. 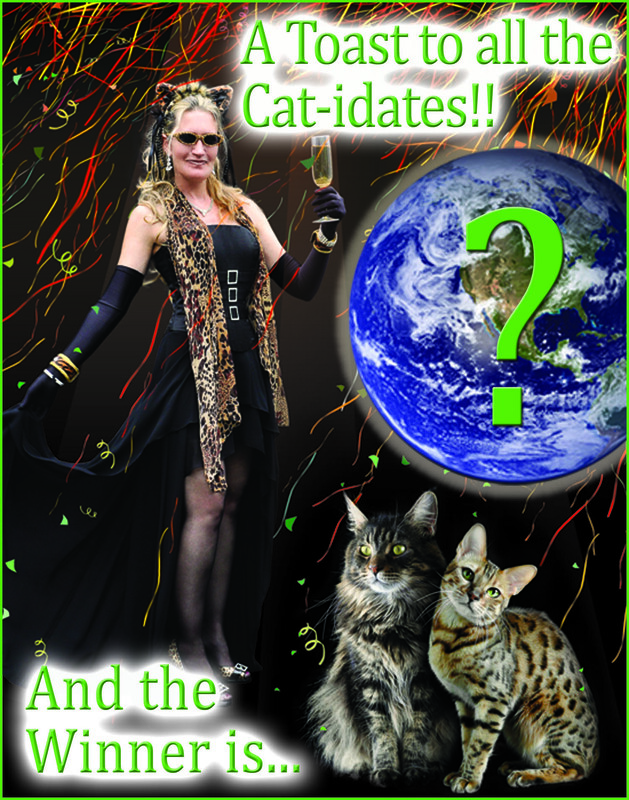 As you may recall, the dapper Austin of CATachresis was unable to win the runner-up prize of 1000 cat food meals from Halo / Free Kibble for the shelter he was campaigning for, Freshfield’s Animal Rescue, because they cannot ship outside of the U.S. and Austin is a Brit through and through. Being the benevolent chap he is [this might be an exaggerated and unconfirmed point], he offered to donate his share of the meals to a U.S. shelter and we loved the idea so much that we asked readers to leave a comment as to which shelter they wanted to donate them to. The response was absolutely overwhelming – so many wonderful people are grateful for all the shelters across the country and we are so glad that the drawing was random, because all the shelters are so deserving. Now that we have the winner, we decided that Austin should get to wear his tux one more time and make the announcement. 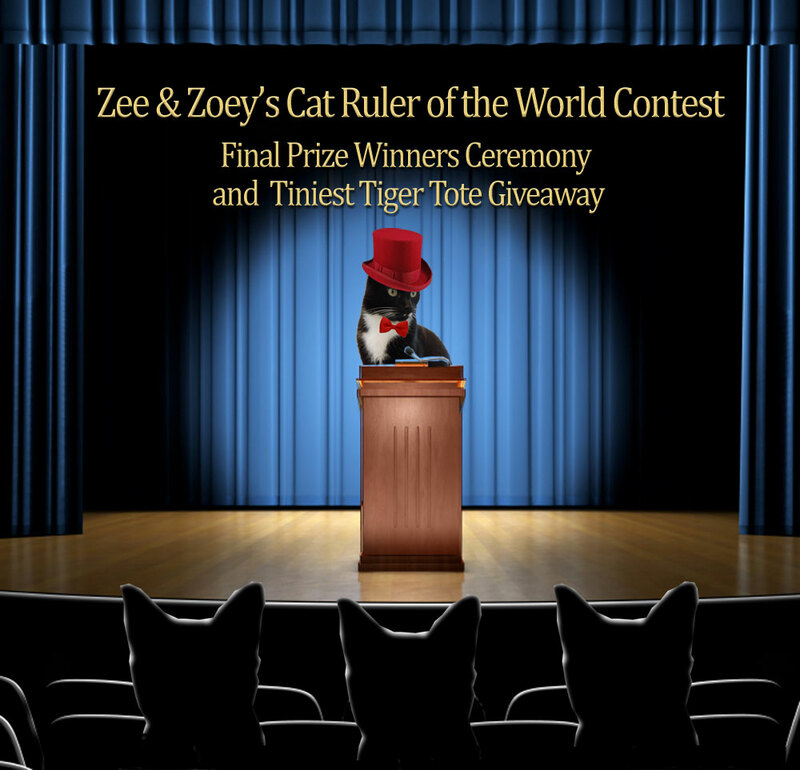 We are also letting him announce all the $20.00 gift certificate winners provided by our friends at Meow.com, as well as who won our Tiniest Tiger Tote from the Red Carpet Cat Twitter Party that we were part of last week. 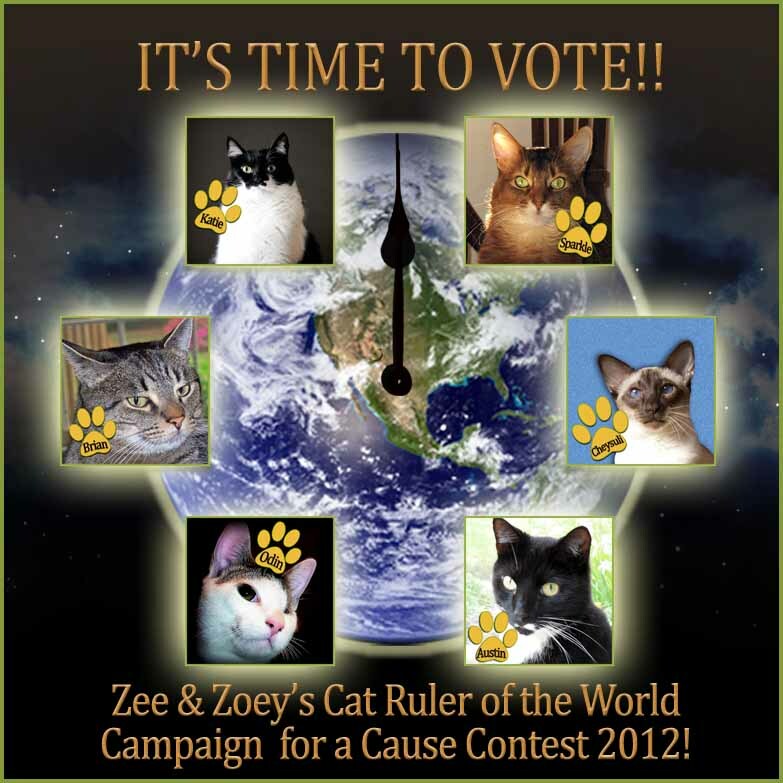 Zee & Zoey’s Rule the World Contest – Closing Arguments and Polls are Opened for Voting! Okay all you cats and kittens – please be forewarned that the statement to follow may be a bit graphic and shocking and you may want to leave the room. Breaking news – Zee and Zoey are admitting to the world that they like dogs. Not just like, they love dogs! This poorly taken image was shot in 2005 before we had a digital camera and BZ (before Zoey). We no longer have dogs, but cherish the memories of our multi-pet household. Left to right - Harley, Bandit, Zee, and Jazz.